You are a solo-artist or a band and you’re looking for compositions or lyrics for your project. We put our heads together to make a composition/lyric at your demand. We evaluate the result together and you sing/play the composition. 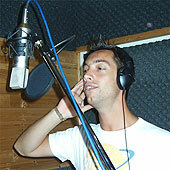 When needed we take care of the music and backing vocals. We mix the song and master it so you can take your own CD home.